Bluegills, or Lepomis macrochirus, are a type of sunfish that are naturally found in the Atlantic and the Mississippi River, according to Texas A&M University. These small fish, named for the blue tinge along the lower jaw and gill, are feed for larger farm-raised species fish. However, bluegills are nutritious, mild-tasting fish that you can feature in a variety of recipes. A 3-ounce serving of cooked bluegills contains 97 calories, and bluegills are naturally free from carbohydrates. Bluegills are a good fit on low-calorie and low-carbohydrate diets for controlling your weight. Broil bluegills with lemon juice and garlic and serve them with steamed asparagus, or stir-fry the fish with mushrooms, green peppers, onions and tomatoes for a low-calorie and low-carbohydrate entrée. Broil or bake bluegills instead of breading and frying them to avoid adding calories and carbohydrates. Each 3-ounce portion of cooked bluegills provides 21 grams of protein, or 42 percent of the daily value based on a 2,000-calorie diet, and less than 1 gram of total fat. Healthy muscles require protein, and protein is also essential for maintaining a strong immune system. Full-fat cheese and some meats, such as fatty beef, sausage and bacon, are among the top contributors to the unhealthy saturated fat content of the typical American diet. Lower your saturated fat consumption by choosing bluegills as a source of protein instead of fattier foods. A 3-ounce serving of bluegills supplies 1.3 milligrams of iron, or 7 percent of the daily value, and 2 micrograms of vitamin B-12, or 33 percent of the daily value. These nutrients are essential for producing healthy red blood cells. Iron is a mineral within hemoglobin, and vitamin B-12 is a vitamin whose presence is necessary for your body to synthesize hemoglobin. Vitamin B-12 is naturally present in only animal-derived foods, and the form of iron in animal-based foods, such as bluegill, is more easily absorbed than the iron in plant-based foods. Cholesterol in a non-essential nutrient in animal-derived foods, such as seafood, meat, dairy products and eggs. A 3-ounce serving of cooked bluegills contains 73 milligrams of cholesterol. The 2010 Dietary Guidelines caution that consuming a high-cholesterol diet can contribute to higher levels of blood cholesterol and an increased risk of developing heart disease. Healthy adults should limit daily cholesterol consumption to a maximum of 300 milligrams. 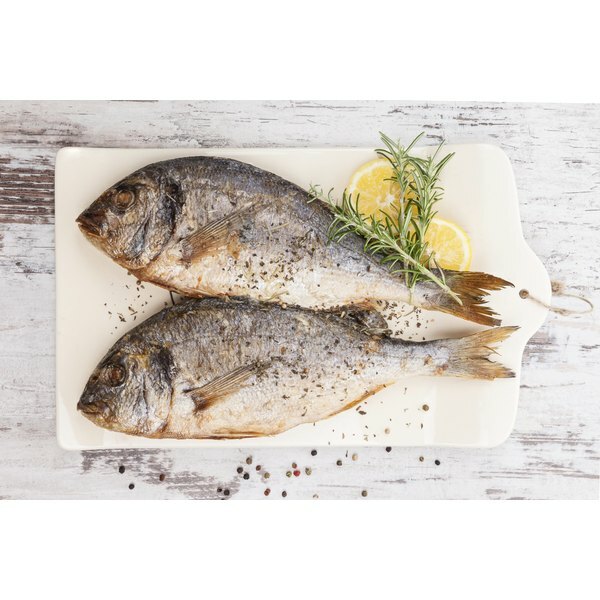 Dietary saturated fat content can have a greater effect on blood cholesterol levels than dietary cholesterol, so avoid using highly saturated fats, such as butter, to prepare the fish. Instead, use a small amount of olive or canola oil, which is low in saturated fat.